Another “Oops” In My Tree, Learn from my Mistake! Many years ago, as I built my husband’s tree, I puzzled over his grandmother Dorothy (LeBlanc/White) Little. You see, in 1920 and 1930 Dorothy was living with Herbert and Annie White in Lynn, Massachusetts and listed as “daughter”. By 1940, she resided at the same address as Herbert and Annie, and was listed as “wife” to David Little. Dorothy’s first three children, also enumerated, were named David, Dorothy and Herbert, and in all three censuses, Dorothy’s birthplace was listed as Massachusetts. 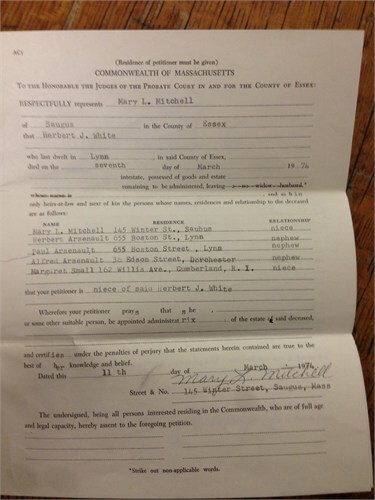 Herbert White’s Naturalization papers name a daughter Dorothy, born 12 June 1912. Yet, I couldn’t locate Dorothy’s birth in the Massachusetts indexes or vital record collections on Ancestry.com, FamilySearch.org or AmericanAncestors.org. Frustrated, I wrote to the Lynn Town Clerk. Within a week, I had a transcription of Dorothy’s birth record. The transcription offered the same birth date, named her father Herbert LeBlanc (note that White is a common Americanized version of LeBlanc) and mother Annie Brown. Hmmmm, I thought, “the birth must be misindexed in every online database”. 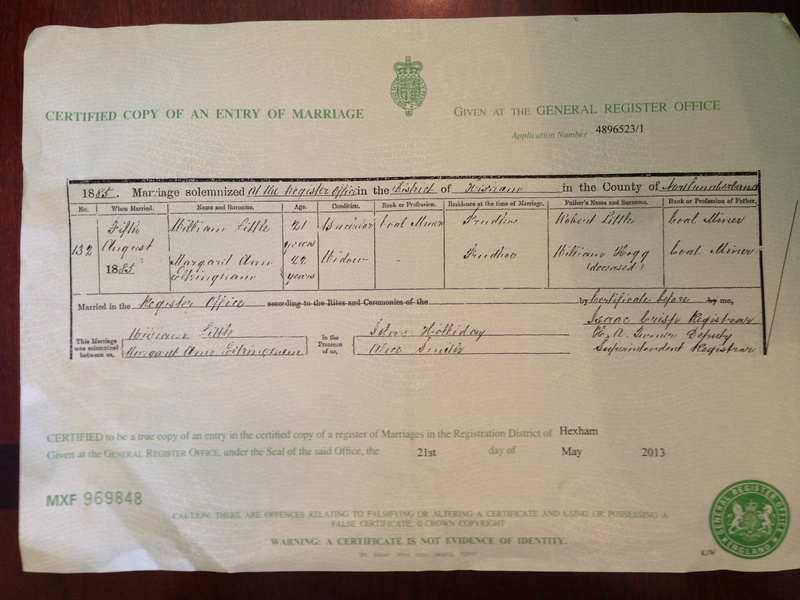 I couldn’t find a marriage record for Herbert and Annie under White or LeBlanc between Herbert’s 1908 arrival from Canada and Dorothy’s 1912 birth. Perhaps they returned to Canada (where Herbert was born), married and had the baby there? Or was that misindexed too! Sigh. Although I had plans to visit the Massachusetts Vital Records office in Dorchester to view Dorothy’s marriage and death records, it just hasn’t happened. I built out my husband’s tree and have Herbert Leblanc descending from Daniel LeBlanc who died in Acadia about 1695. Ironically, my mother also descends from this family, thus I am Herbert’s 6th cousin 3x removed. My husband and I are cousins! I did make it to the Essex County Courthouse. Dorothy died about 10 years before her father; she left six children and those children received not a penny when Herbert died in 1974! His sister Agnes’s five children were named as sole heirs to his $19,000 estate. He must have disowned Dorothy’s children (I blogged about it here)! This came as no surprise. I won’t go into detail, but my husband’s father (now deceased) was a despicable human being who literally should have spent his life in prison. I haven’t looked at this line in about four years. This morning, I tracked down a number of Agnes’ grandchildren on Facebook, introduced myself as a cousin and asked if they knew why Herbert might have disowned his grandchildren. The response? SHOCKING! Here is a picture of Herbert and his wife Annie. But, as far as we know, Herbert didn’t have children or grandchildren. He married a woman named Annie who already had a baby named Dorothy. He helped raise her, but it wasn’t his baby. WHAT? But I have a Naturalization and birth certificate that name him as her father!!! She named a child after him! Then, I took another look at the Lynn birth records for 12 June 1912. …”Chambers”, born to Frank Chambers and Annie Brown in Lynn, Massachusetts. Then, in the 1910 census…. a Frank Chambers was enumerated as a boarder in the home of Annie Brown, in Lynn (http://tinyurl.com/jz5daj3). Next, a marriage on 20 Aug 1911 between Frank Chambers and Annie Brown in Lynn. And last, (double sigh)…a marriage dated 12 June 1916 in Lynn between a Hubert LeBlanc and a divorced Annie Chambers, daughter of William Brown. I explained away inconsistencies by making them fit my story. I did not do an exhaustive search. I still don’t have Dorothy’s marriage and death records (perhaps they do name Chambers as her father). I did not look for Herbert and Annie’s marriage after Dorothy’s date of birth. I trusted that the birth transcription from Lynn was accurate. I did not carefully look at all the births registered in Lynn on that date (there were only three). I do have another case where my g-grandmother named her step-father as her father (first when she married and then when she applied for social security), I’ve been through this, yet clearly I missed the lesson! So my husband has a new tree and we are not cousins (at least through this line). Annie Little was born Annie Chambers and her father of Irish descent, not French Canadian. But…I am thrilled to have a photo of Herbert and Annie. And although Herbert will always be part of our story having raised Dorothy and being my distant cousin, I am glad to have been able to correct the error vs. passing it to future generations. UPDATE: I contacted the Lynn Town clerk and they seem reluctant to send me a photo of the original birth record. They claim there are no anomalies (i.e. erasures, margin notes or the entry being written years after the birth) and could not explain the discrepancy between their entry and the state record, but offered to call vital records and will get back to me….. Meanwhile, one of Herbert’s nieces, who I met on Facebook, has DNA tested with Ancestry.com. The niece’s matches are with Acadians (many in common with my 50% Acadian/50% Lithuanian mom), many of them LeBlanc. The niece uploaded her results to GEDMATCH for me (since hubby tested on 23andme) and my husband matches 56 cMs on 21 segments with the largest being just 5.2cM’s. Certainly not indicative of a 2nd cousin once removed (who should share on average 106.25 cM’s – see the ISOGG Wiki – here). Lots of smaller segments likely indicate that they have many distant Acadian matches (my husband is perhaps Acadian through his maternal brick walled LeBlanc line – he, my mother and the niece have a few hundred common matches in “People who match both kits”). The divorce paperwork arrived. The Annie M. Chambers who married Samuel F. Chambers on 20 Aug 1911, filed for divorce on the grounds of abuse, 30 March 1915. She asks for custody of the 2 year, 9 month old minor child, Dorothy E. Chambers, who was “born of the said marriage”. 52 Ancestors, week #15 – Louis Napoleon Chalifour – UPDATE!! 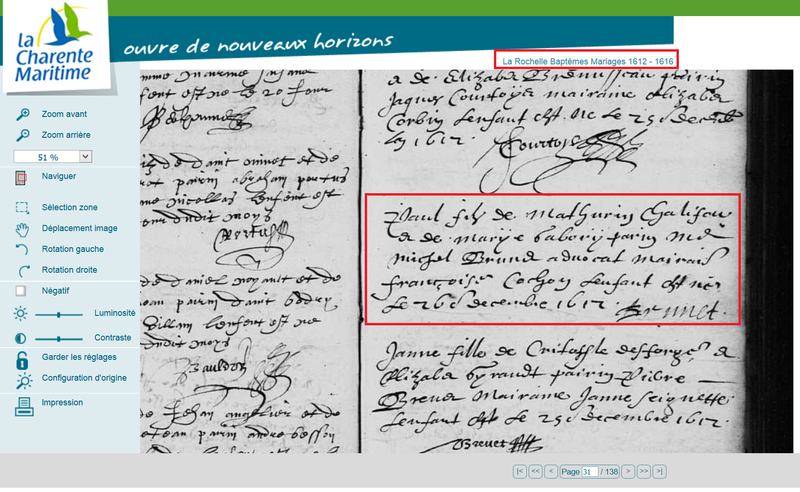 Mathurin Chalifour’s son Paul Chalifour, the first in the line to immigrate to Quebec was 15 years old during the Siege of La Rochelle in 1627. The Siege of La Rochelle (French: Le Siège de La Rochelle, or sometimes Le Grand Siège de La Rochelle) was a result of a war between the French royal forces of Louis XIII of France and the Huguenots of La Rochelle in 1627–28. The siege marked the apex of the tensions between the Catholics and the Protestants in France, and ended with a complete victory for King Louis XIII and the Catholics. During the siege, the population of La Rochelle decreased from 27,000 to 5,000 due to casualties, famine, and disease. The remaining Protestants of La Rochelle suffered new persecutions, when 300 families were again expelled in November 1661, the year Louis XIV came to power. The reason for the expulsions was that Catholics deeply resented a degree of revival of Protestant ownership of property within the city. The episode of “Who Do You Think You Are?” featuring Tom Bergeron which first aired on 30 Aug 2015 recounts the horrific details of these ancestors who were subjected to starvation and religious persecution: http://www.tlc.com/tv-shows/who-do-you-think-you-are/videos/tom-bergeron/. Louis Napoleon “Napoleon” Chalifour, a descendant of Mathurin and Paul is the subject of today’s sketch. He was born to Jean Elie Chalifour and Helene Gagnon and baptized 29 January 1879, in Plessisville, Québec, Canada. In 1891, Napoleon, age twelve (placing his birth at about 1889), is found residing in Plessisville (also known as the village of Somerset) with his widowed mother and a few siblings. He was enumerated as Louis Chalifour. He married Marie Josephine Rose de Lima LeBlanc, daughter of Antoine LeBlanc and Herméline Thuot, on 5 Feb 1902 in Montreal, Canada. The marriage record names Napoleon’s parents and indicates his father is deceased and his mother is of Saint Cecilia de Valleyfield (she likely moved to be near or with family; Napoleon’s sister Beatrice married two years earlier, in 1900, and at that point, their widowed mother was said to be of Plessisville). Napoleon had four sons – Henry, Leon Pierre, Louis Albert and George between 1903 and 1907. My husband descends from Albert. In 1911, the family lived in Jacques-Cartier, Quebec. They are Catholic, primary language is French, and Napoleon is in construction. Napoleon is listed as age 32 and his birth as January 1879. Napoleon emigrated to Salem, Massachusetts (my husband’s birthplace) before May 1915 – the date when his family crossed the border, claiming they were to join him. The family lived together on Foster Street in 1920. A 43 year old Napoleon, which places his birth at about 1878, was listed as a house carpenter who had applied for naturalization. He is listed in the 1922, 1924 and 1926 city directories, as a carpenter, at this address. That’s where the trail ends. The 1927 and 1928 city directories are not available online. In the 1929 & 1930 city directories and 1930 census, his wife is listed as a widow. The only Chalifour’s listed in the 1926 to 1930 Massachusetts death index are Alfred J A, Elie and James Henry all of Salem. A Declaration of Intent to become Naturalized has not been found. Napoleon was in Pennsylvania, years earlier, working as a Carpenter, in 1918, when he registered for the WWI draft. He lists a birth date of 27 July 1870 and names Rose Chalifour of Salem, Massachusetts as his wife and nearest relative. The birth year is a bit off (perhaps an error, or he was trying to make himself appear older to avoid military service). So… Napoleon is on my “list” of folks to research this summer. Did he return to Pennsylvania? To date, I haven’t found any evidence to support this nor have I located a record of his death there (Pennsylvania death certificates are online at Ancestry.com). A Napoleon Chalifour registered for the draft in 1942 in Oklahoma. This Napoleon is listed as 5’5″, 160 pounds with blue eyes, blonde hair and ruddy complexion. The WWI draft card list’s my husband’s Napoleon as medium height, stout build with blue eyes and brown hair – not exactly a similar description….other than the blue eyes. But, he claims a birth of 27 January 1878 in Plessisville, Canada. This birth day (January 27th) matches that of the WWI draft record. All baptisms were examined in Plessisville and there was only one Napoleon listed in that parish in that time period. Yes, my husband’s “missing” g-grandfather, who was baptized 29 January 1879. Further, there was only one other Chalifour family baptizing children in Plessisville in that time frame (records were examined from 1854 to 1885). Hilaire Chalifour and his wife, Flavie Moreau baptized a son Georges in April of 1879, thus it is unlikely that they also had a son Napoleon that same year who’s baptism went unrecorded. Note that baptisms were recorded individually, implying the children were baptized soon after birth (vs. having to travel to a priest or wait until a traveling priest was in town to baptize multiple children at once). Last, my husband has a 2nd-3rd cousin Autosomal DNA match on 23andme to another descendant of Jean Elie Chalifour and Helene Gagnon through their son Elie, so it is pretty likely hubby’s Napoleon is the one baptized in Plessisville and the one who appears later in Oklahoma. In 1942, Napoleon’s close contact (at the same address) is Mary Chalifour. The 1940 census lists Napoleon and Mary as husband and wife living in Crutcho, Oklahoma. Napoleon’s occupation is “carpenter”. The same occupation as my husband’s Napoleon. Died of cancer at St Anthony Hospital. Lived in the United States about 30 years. No living relatives are known. Although the birth year and place differ from the 1942 draft registration (but the date is again listed as 27 January). Other records have not been located – I primarily searched for a marriage record to Mary, the 1930 census, his application for Naturalization, death certificate and obituary. I also searched for the Napoleon of Oklahoma in earlier records without success; this negative result is another indicator that Napoleon of Oklahoma and Napoleon of Salem are the same person. A comparison of the 1918 and 1942 signatures are inconclusive. It is interesting that both sign as Nap not Napoleon. The C in Chalifour is similar. I ordered Napoleon of Oklahoma’s SS-5 (social security application) to see who he named as parents and to match up the signature with that of the draft cards! Note that social security numbers beginning with 444-10 were issued in Oklahoma from 1936-1950, so this neither supports or disproves the theory…… A copy of the application, completed by Napoleon, should arrive within 3 weeks Stay tuned! The SS-5 has arrived! Napoleon Chalifour of Oklahoma likely filled out the application, dated 17 July 1937, where he names his parents as Eli Chalifour and Helen Gagnon (a match to the man baptized in Plessisville, Canada and to the man who married Josephine Rose de Lima LeBlanc) and a birthdate of 27 January 1876 (matching the birth month/day of the Napoleon of Salem; he perhaps added four years to his age to claim Social security benefits earlier?). He does report a birth place of Verdun, France (perhaps he was fearful the government would identify him as the missing Salem man? or perhaps this fib makes it less likely they would have the ability to disprove the 1876 birth year). Despite a few inconsistencies, this further supports the theory that Napoleon of Salem and Napoleon of Oklahoma are the same man. This week , being in Boston for Easter and the Marathon, I seized the chance to hunt down some Essex County probate records. The Essex County Probate Office is located at 36 Federal St, Salem, Massachusetts. A 30 minute ride from Boston via commuter rail, then a 2 minute walk. From Boston, I headed to the North Station commuter rail (inside the TD Garden, home of the Bruins & Celtics) and bought a round trip ticket to Salem on the Newburyport/Rockport line. The tickets are $6.50 each direction at the ticket office, but cost $9.00 each way if you buy them on the train. I arrived about 10 minutes prior to departure, and had plenty of time to purchase tickets and board. The train schedule can be found here. On arrival, I crossed the road to the court house. After security, I headed to the second floor, where a sign read: “Essex Probate and Family Court is moving to its new location at 45 Congress St., Ste. 170, on April 28, 2014″. It appears that the new location is about 1.3 miles from the train station. The room was fairly small. Indexes dated back to the early 1600’s. The early indexes and probate documents are microfilmed and on file at NEHGS on Newbury Street; but I got better photographs of the “Pinder” entries from these books. Bound indexes run through 1988. A file cabinet holds index cards for records 1988 and forward. I also noticed a series of divorce record indexes (I neglected to record the date range). The staff was VERY nice. Unlike past probate experiences in other locations, every person I encountered here went out of their way to help me; all were upbeat and friendly. I overheard a few “crazy” customers during my visit; there wasn’t an ounce of frustration from the employees. They happily and patiently dealt with each issue/question. I located six index entries related to my and my husband’s ancestors and completed one form (located at the front desk) for each docket. Within minutes the dockets were delivered. I was given permission by the manager to photograph the records with my Iphone! I have found that probate offices usually don’t allow cameras, typically I spend a small fortune making copies and scanning them into my tree later. Using Ancestry.com’s Shoebox application, I photographed, tagged and immediately uploaded each image to my Ancestry.com tree. 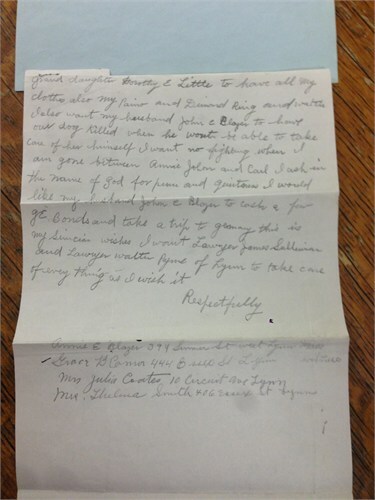 My search included my husband’s 2nd g-grandmother, Anna/Annie Elizabeth Callahan/Callan of whom I have written previously: here – I had hoped to find a copy of the handwritten will, mentioned in a newspaper article shortly after her death. I was not disappointed, it reveals a bit of her personality and perhaps a strained relationship between Annie’s daughter and husband. Anna/Annie Elizabeth Callahan/Callan was likely born about 1868, near Dublin, Ireland. She immigrated to Massachusetts and married first, William Brown/Braun, a German immigrant. They had one known child, Anna Maria “Annie” Brown, born 24 July 1894. William likely died before 1905. She married second, a German immigrant, John Carl Blazer, in Portland, Maine, on 7 December 1905. 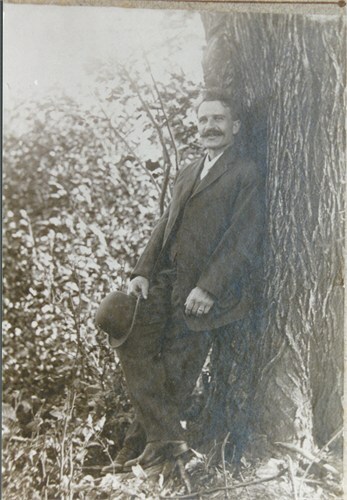 He had one known living child, Carl Paul Blazer from his first marriage to Mary Louise Therault. Mary and their infant son, Phillip, died in 1899. In 1910, Annie E., John and children Annie M. and Carl, rented a home on 364 Summer Street, Lynn, Massachusetts; shared with two boarders. In 1920, Annie E. and John were renters at the same residence and living alone. 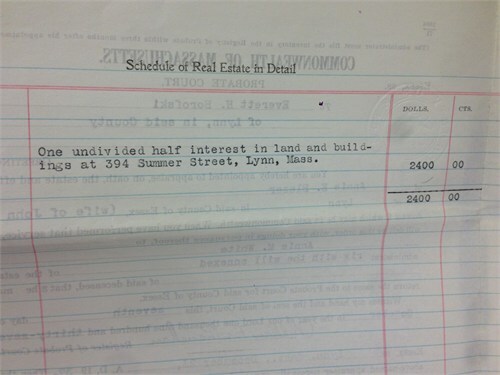 By 1930, they were listed as owners of 394 Summer Street in what appears to be a co-owned home. 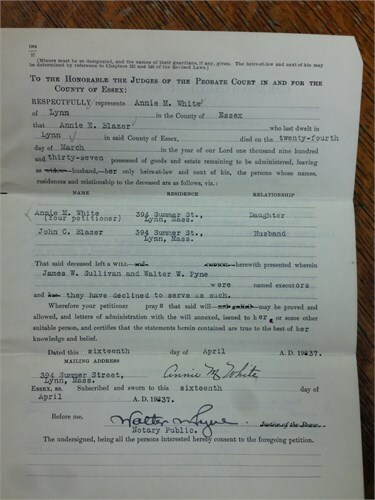 Annie E. and John Carl were enumerated with a boarder. Daughter Annie M., was enumerated with her husband Herbert White/LeBlanc (also listed as owner at the same address), her daughter Dorothy, her husband David Little and their infant son David (Dorothy was a product of Annie’s first marriage to Samuel Chambers, they divorced, Annie claiming he was abusive). Dorothy and David Little went on to have six known children – Annie’s g-grandchildren – at least three of whom were born prior to her death. David R., Dorothy Elizabeth, Herbert John, Anna “Chick”, Donald and Robert. On 24 March 1937, Annie died from Grippe-Acute Bronchitis Myocarditis Mitral Regurgitation at the age of 69. She was buried at St Mary’s Cemetery, Lynn. I Annie E Blazer of good sound mind and judgement will my half Share of house at 394 Summer St to my daughter Annie M White of 394 Summer St West Lynn Mass I also want My husband John C Blazer to have the use of the same rooms we both now use and to make his home there as long as he lives or else do just as he wishes about his living. Carl P Blazer owes me $50.00 cash. I also wish to call it square his share I want my husband John C Blazer to make over to his son Carl P Blazer all GE Co life insurance also the Weapidy Insurance witch will give Carl P Blazer more than My daughter Annie M. White I also want my grand daughter Dorothy E Little to have all my clothes also my Paino and Diamond Ring and watch. Annie E.’s daughter Annie M., died in 1942 and granddaughter Dorothy in 1964. Annie M.’s husband Herbert White/LeBlanc left nothing to Dorothy’s children (his step-grandchildren). 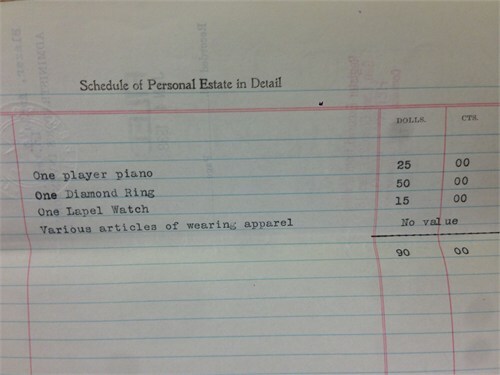 His sister Agnes’s five children are named as heirs to his $19,000 estate (another “find” at the Essex probate office). Special request from my husband that I write about one of his ancestors this week – hmmm… Valentine’s gift? 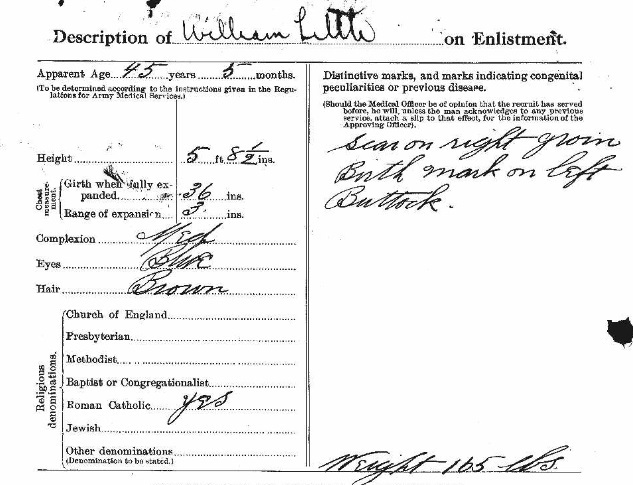 I selected his g-grandfather, William Little. I have lots of records which lead to lots of questions! (1) My husband’s father (deceased) recalled visiting relatives in Cape Breton, near a place called MacDonald Hill (I haven’t located this place, but suspect it is in Sydney) and he remembered being told that his ancestors were “moonshiners”. (2) My husband’s mother recalls visiting Nova Scotia in 1960, and meeting relatives, Frank and Florence (Little) Marmo. (3) My husband knew he was the grandson of David Little, who was born in Cape Breton, married Dorothy White, and lived in Lynn Massachusetts. 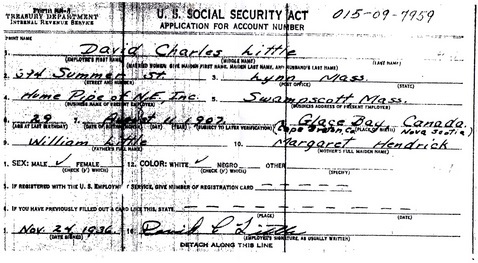 Since I couldn’t locate David’s Massachusetts marriage record (for reasons explained in a past blog post: https://passagetothepast.wordpress.com/tag/leblanc/), I instead ordered David’s SS-5 (Social Security Application), a form he completed in his own handwriting, in 1936, to uncover his place/date of birth and parents names. Although records report William’s birth year anyplace between 1857 and 1872, he was likely born 22 September 1865, on Scotswood Road or in the village of Scotswood, Newcastle upon Tyne (commonly known as Newcastle, in Tyne and Wear, North East England) historically part of Northumberland, to Robert Little (illegitimate – parents names unknown), a coal miner and Elizabeth Harrison (daughter of Thomas Harrison). The birth (pictured below) which lists a residence of Blaydon, Winlaton in Tyne and Wear is approximately 3.8 miles from Scotswood Road. Several records list a birthplace of Scotswood, Scotswood Road or Northumberland (one lists siblings born in Scotswood) In two military records, he reports his birth as 22 September, one census lists a September birth month. 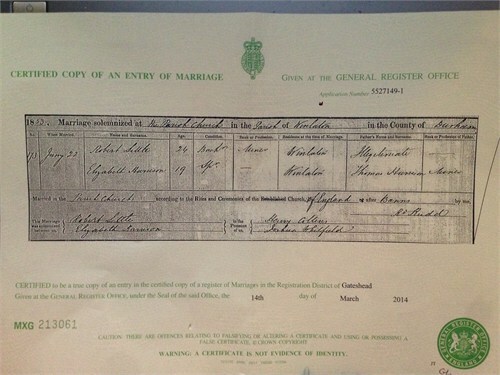 He married twice, his father is reported as Robert (marriage #1) and Albert (marriage #2 – a typo?) . 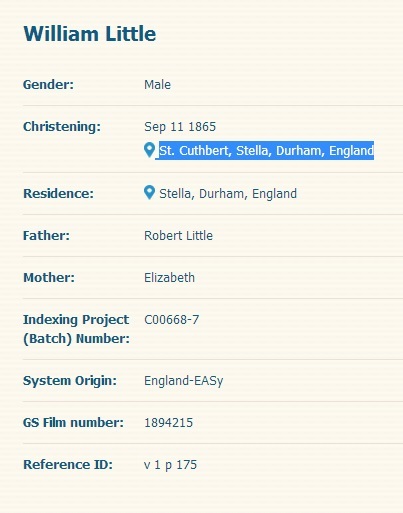 There was a William Little born to a Robert and Elizabeth baptized on 11 Sept 1865 at St. Cuthbert, Stella, Durham, England which could be our William. Gathead and Hexham Turnpike Road and the Eastern Boundry of St.
Park wall & St Paul’s Ecclesiastical Boundry To Haggerstones Mill”. I hope to one day uncover a Y-DNA match which would help confirm this theory. 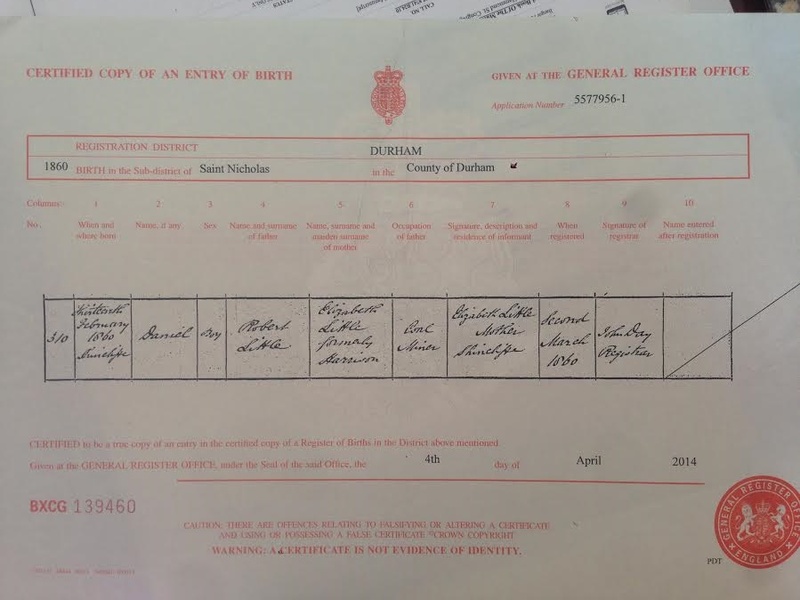 Although William’s father Robert lists “illegitimate” under “Father’s name & surname” on his marriage certificate – which explains a lack of “Little” Y-DNA matches – perhaps Robert’s mother was a Little. His father (according to close DNA matches) could be Armstrong, Irwin/Erwin, Moffatt, Bell or something else! If this is our William, then he had 10 known siblings. In 1861 William’s parents Robert and Elizabeth were living on Cuthbert Street, Blaydon, Winlaton, Gateshead, Durham (St Cuthbert’s/Stella parish). Family members included Robert (34), Elizabeth (26), Eleanor (7), Samuel (5), Daniel (1) and a visitor John Harrison (27 – perhaps Elizabeth’s brother, or other relation, as her maiden name was Harrison?). In 1881, his family was living at 55 Spen Road, Village of Spen, Chopwell, Bladen, Chester-le-St (Parish of St Paul). The family included Robert (55) a coal miner, likely for Garesfield Colliery, Elizabeth (46), Daniel (20), William (15); Thomas (12), Margaret (10), Betsey, (7), Robert (5) and Mary Ann (2). William, who claims to be age 21 (if born Sept 1865 he would have been 19? ), first married, on 5 August 1885, Margaret Ann Hogg, age 22, daughter of William Hogg and the widow of Thomas Eltringham. He was a bachelor and coal miner. She had a three year old daughter, Mary Isabella. They were married at Hexham, in the register office. The couple resided at Prudhoe where William was likely employed by the Prudhoe Colliery. Prudhoe is a medium-sized town in Northumberland on the edge of the Tyne Valley. The town is 10½ miles east of Hexham and about 11 miles west of Newcastle upon Tyne. On 18 June 1886, their first known child, Robert William Little, arrived. At that time, they were living in Ryton Woodside, Durham, the town of Margaret’s birth and residence of her widowed mother. The next child, Florence was born a few years later. By 1891, the family had relocated. William, a coal miner, likely employed by Garesfield Colliery, is living in terraced housing on 60 Spen Road, a four room home in the Village of Spen, Chopwell, Bladen, Chester-le-St (Parish of St Paul). 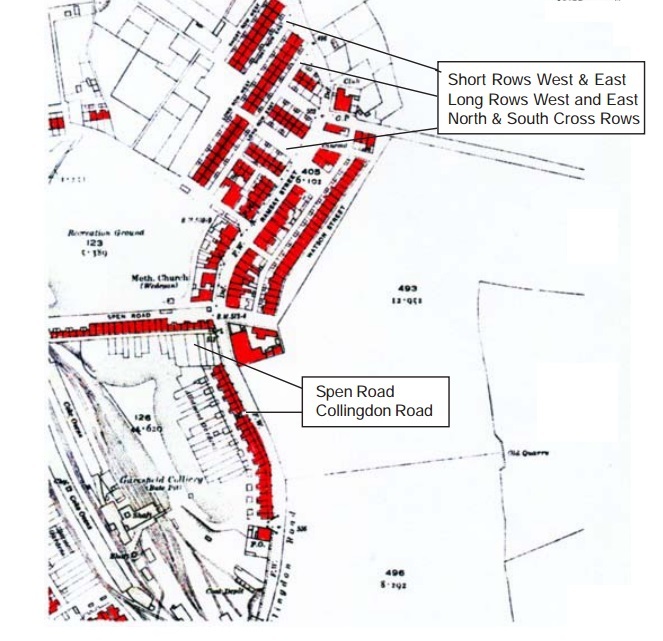 The homes on Spen Road were built by the Marquis of Bute who owned the coal royalty at the time (an interesting study of the village: http://etheses.dur.ac.uk/4469/1/eThesisAW.pdf?DDD5+ /). was a surface drain gulley at the edge of the pavement and each house had one internal cold water tap. The homes are no longer in existence, but the view can be seen on Google Maps – address Spen Rd, High Spen, Rowlands Gill, Tyne and Wear. The household included: William (24), Margaret (24), Robert (4) and Florence (1). Margaret’s 8 year old daughter, Mary Isabella, was residing with her maternal grandmother Ann Hogg in Durham, Ryton Woodside. In 1891 his parents were still living nearby at 55 Spen. On 23 April 1891, baby Selina arrived. The family was still living in Spen. Their daughter Elizabeth was born in 1894. By 1901, the family is in a four room home, 9 Croniwell Row, Hamsterley, Medomsley, Lanchester, Consett, North West Durham (Parish Saint Mary Magdalene). Formerly known as Hamsterley Colliery due to the large Mining Colliery which was situated to the south of the village along the southern banks of River Derwent. 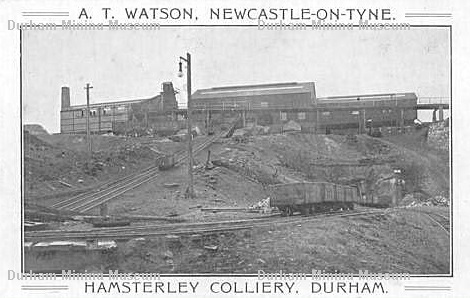 The Colliery was halfway between Hamsterley and High Westwood. One of two villages of this name in County Durham, it should not be confused with the larger village of Hamsterley, 20 miles to the south. In 1902 there were 547 workers at the mine, 437 below ground, 110 above ground (http://www.dmm.org.uk/colliery/h002.htm). The family included William (36) a coal miner/hauler, Margaret (39), Mary Eltringham (step daughter, 19), R. William (15), a coal miner/driver, Florence (12), Selina (11) and Elizabeth (6). By 30 August 1904 it seems that the Little’s were again residing in Rowlands Gill, at 32 Lilley Terrace, and William was working at the Garesfield Lilley [Colliery], Winlaton (see minutes from the Meeting of Cottage Homes Committee, below). 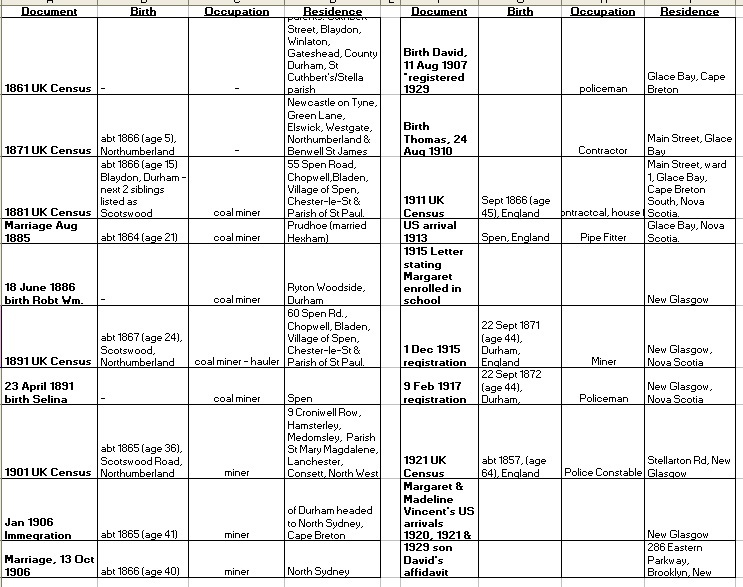 THE BEGINNING – Coal Mining in the Garesfield Area. The first reports of mining in the area were near Chopwell, dating back before the 14th century. A pit was also worked there from 1605 – 1645. These pits would probably have been bell pits, the miners accessing seams near the surface. The first deep pit was the Maria pit near Greymore Hill, started in 1756, and by 1767 there was Whitefield Colliery near Chopwell, producing 31 800 tons per year and one at Barlow Fell producing 13 200 tons. It was, however, 1765 that saw the beginning of the ‘Garesfield’ pits with the opening of a pit near Ash Tree farm, Low Spen, followed by a one on the land of Garesfield farm at High Thornley. These pits were the property of prominent local land owners and the holders of coal royalties; the Marquis of Bute, High Spen and Miss Simpson of Bradley Hall, Wylam. When the pit at Garesfield farm closed in 1837, it was replaced by the Bute pit at High Spen and as a reminder of the earlier Garesfield pit, it and its associated works were named ‘Garesfield Colliery’. Then over the years, as the owners opened, or acquired interests in more collieries, each one had ‘Garesfield’ in its original name or was changed to include it; there being Garesfield, South Garesfield, Victoria Garesfield, Axwell Garesfield, Swalwell Garesfield, Lilley Garesfield and Dunston Garesfield. All but the first three eventually lost the ‘Garesfield’ suffix, only the names of Garesfield, South Garesfield and Victoria Garesfield remaining unaltered. It is unknown if William divorced or was a widower or why he decided to leave the UK, likely he was seeking work in the Canadian, Glace Bay mines.In late December 1905, William and the children set sail on the vessel Dominion from Liverpool to Halifax, Canada as 3rd class passengers. “Little” passengers include William (41) miner, Robert (20) laborer, Florence (19) domestic, Robert (17) domestic, Fredric (16) domestic, Ernest (16) domestic, Selina (12) child, and Lizzie (11) child. Ernest was actually Ernest Pickup and Frederic was Frederick Marsh. The surname of Robert #2 is unknown. The arrival manifest, dated 6 Jan 1906, is slightly different. 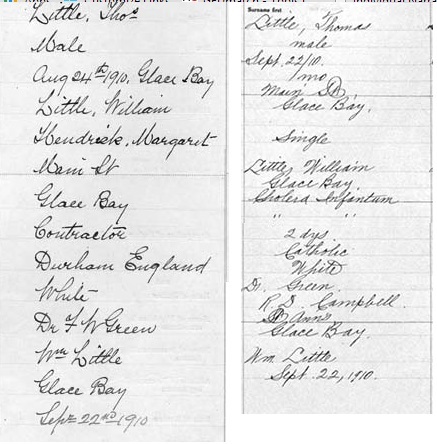 William is erroneously listed as “Mrs Little” a 41 year old miner (the married/single block is blank). Frederic is missing. There are no admission and discharge registers for the main Newcastle Union Workhouse, but registers do survive for the Cottage Homes which were established to take in children from the Workhouse. Meeting of Cottage Homes Committee, 30 August 1904: Ernest Pickup was admitted to Homes on 14 August, having left in March 1904 to live with Mr Bryant of Warkworth Crescent, Newburn. Mr Bryant’s home did not appear to be a comfortable one as another boy ran away and Ernest left to live with Mrs Turnbull at Lemington. She wanted the boy to be transferred to her charge so he could work in the pit, but the Committee turned down this application after interviewing her. Meeting of Cottage Homes Committee, 4 October 1904: The Superintendent reported that Ernest Pickup who was admitted to the Homes in August wanted to return to pit work and suggested that he be sent to Mr Little of Rowlands Gill. The Committee recommended accordingly. Meeting of Cottage Homes Committee, 31 October 1905: The Superintendent reported that Mr W Little of Rowlands Gill, with whom three of the Homes’ boys had been living [was the third the unidentified Robert?] and working at the Lilley Colliery, had gone to Canada having obtained a good appointment, and that he wanted the three boys to go too. Two of the boys, Frederick Marsh and Ernest Pickup, wanted to go and the Committee recommended that they be allowed to go. 2 Departure 28 December 1905 onboard ‘Dominion’ departing from Liverpool bound for Halifax, Canada – entry for William Little accompanied by several others all under the surname Little, including Ernest. Nine months after arrival, on Saturday 13 Oct 1906, William married his second wife, Margaret H. Hendrick, born in Placentia, St. John’s, Newfoundland and Labrador, Canada, daughter of Thomas Hendrick and Ellen Carroll. He was listed as a widower, occupation miner. She was about 42 and the widow of Gabriel Vincent (her husband died while she was pregnant). She had three known children Madeline (b. 1898), Frank (b. 1902) and Margaret Jean Vincent (b. 1903). The marriage record lists William’s father as “Albert“, I believe this is simply a transcription error and was meant to be “Robert“. 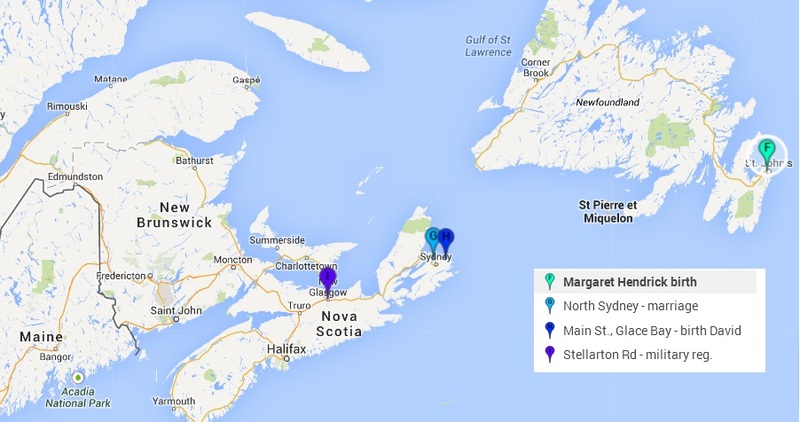 The marriage took place in North Sydney, Cape Breton, Nova Scotia, Canada. Witnesses were John and Rita Lea. The marriage was performed by the Reverend Allan P. Shatford. 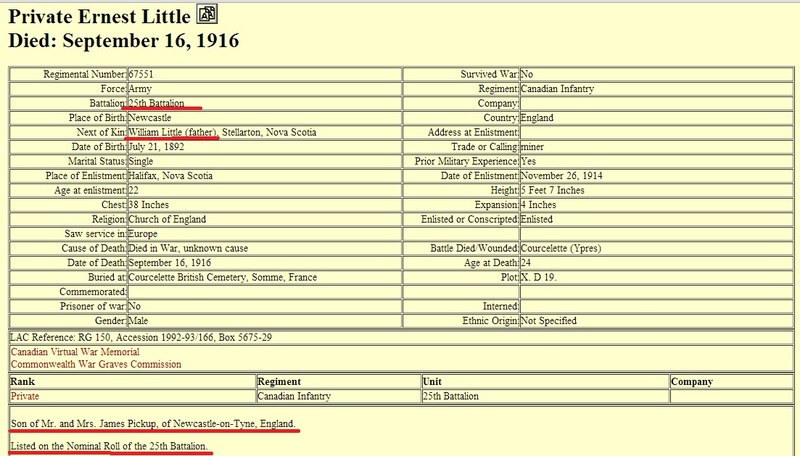 They had a son David Charles, ten months later on 11 Aug 1907 in Glace Bay, Cape Breton. William is a policeman. On 24 Aug 1910 they had another son, Thomas. Sadly Thomas passed away just before his first month’s birthday on 22 Sept 1910 of Cholera Infantum ( a fatal form of gastroenteritis, characterized by vomiting, profuse watery diarrhea, fever, prostration, and collapse). William was listed as a contractor living on Main Street in Glace Bay, Cape Breton. 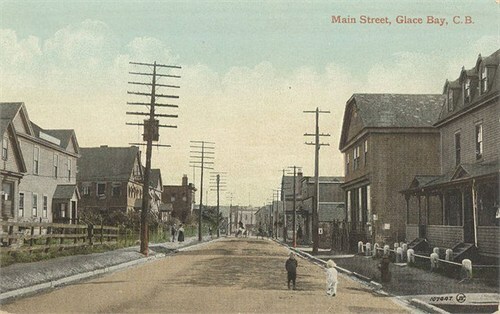 In 1911, the Little’s were enumerated in Glace Bay. They are recorded as Catholic. William is listed as a home contractor and Ernest a miner. Only Ernest [Ernest Pickup, his informally adopted son], David and William’s 3 step children are living at home. They also have a 45 year old boarder David Hinley. In May 1913, William and Margaret attempted to enter the US through Halifax to St. Albans, Vermont and listed a contact of Jane Burwell, 91 Cambridge Street, Boston (Margaret’s aunt). They were debarred – Codes next to them read “Sec 11” (William), “P Defective” (Frank) and “LPC” (all others – meaning “likely to become a public charge”) . 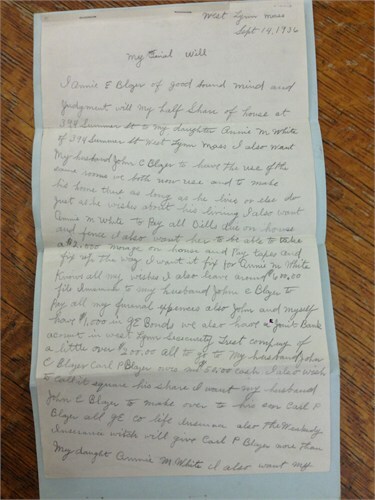 [Email from Lindsay Fulton, Genealogist, New England Historic Genealogical Society, 15 April 2013: I looked closely at the passenger manifest from 1913, and was able to determine that Frank Vincent was classified as “P Defective,” (or physically defective) and suffered from lameness due to hip-joint disease. Because of his disability, the entire family was debarred from entering the United States under Section 11 of the Immigration Act of 1907, which not only allowed an immigration official to deny entry to an immigrant who suffered from sickness, mental or physical disability, or infancy, but also, “if such alien is accompanied by another alien whose protection or guardianship is required by such rejected alien, such accompanying alien may also be excluded, and the master, agent, owner, or consignee of the vessel in which such alien and accompanying alien are brought shall be required to return said alien and accompanying alien in the same manner as vessels are required to return other rejected aliens.” Therefore, because Frank Vincent was not allowed entry, the entire Little-Vincent family was debarred. Thank you for submitting your questions to the NEHGS Ask a Genealogist service]. Ernest [Pickup] Little, David Little and Frank and Margaret Vincent were with them. William is listed as a Pipe Fitter – 5’8″, fair complexion, brown eyes and brown hair. Margaret in 5’6″, fair complexion, blue eyes and brown hair. 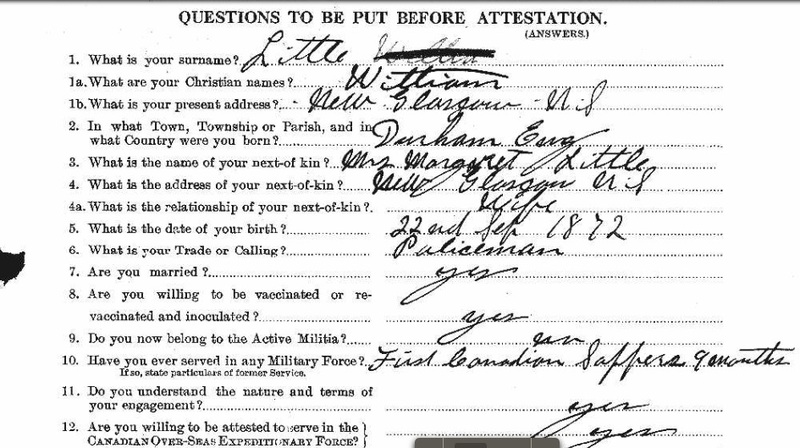 On Ernest’s 1914 military registration William is listed as living in Stellarton, Nova Scotia (likely Stellarton Rd, New Glasgow). 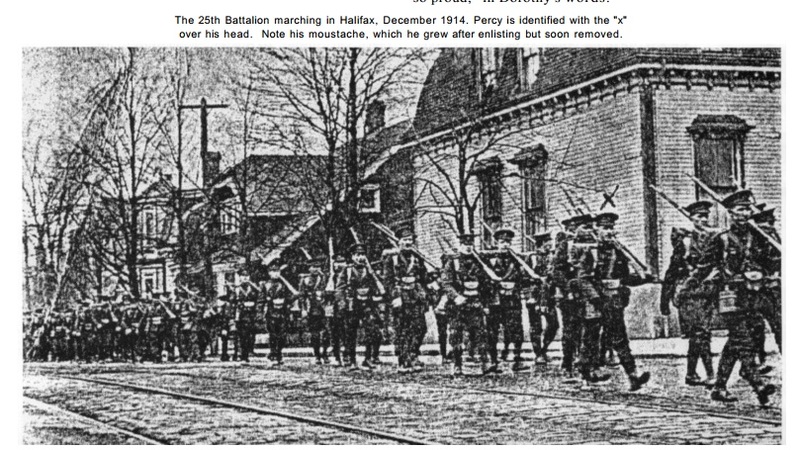 In 1914 there was a patriotic fervor and excitement and, having close family and emotional ties to England, William and Ernest must have decided fairly soon that they must enlist in the 25th Battalion, Halifax, to defend all those values which they held dear and were generally thought to be represented by the empire. Like them, some two-thirds of the men who had volunteered for the first contingent were British immigrants. 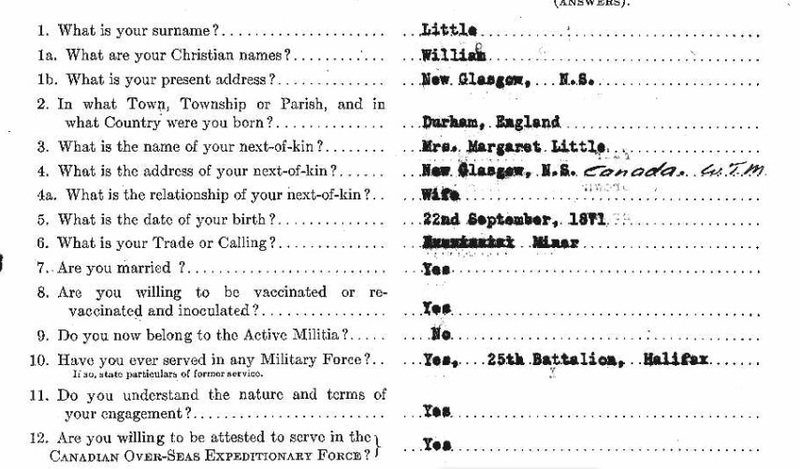 William’s 1 Dec 1915 registration gives an address of New Glasgow and a birth date of 1871 (not certain why or if he might give a fraudulent date – perhaps he wanted to serve and was trying to report that he was in his 40’s and not 50’s). He says his occupation is “miner” and he served in the 25th Battalion, Halifax. William registers again in 9 Feb 1917, this time claiming to be born on the same day (22 Sept) but a year later in 1872 (which would make him age 13 on the date of his first marriage). Or is this a different William?? On this form he lists his occupation as a policeman, he is Catholic; he has a scar on his groin and birth mark on his buttocks. This William has blue eyes and medium complexion (other descriptions specify brown eyes and fair complexion). He says he served 9 months in the First Canadian Saffers. On 16 Sept 1916 Ernest gave his life in the Battle of the Somme, Courcelette, in World War I. He is buried at the Courcelette British Cemetery. 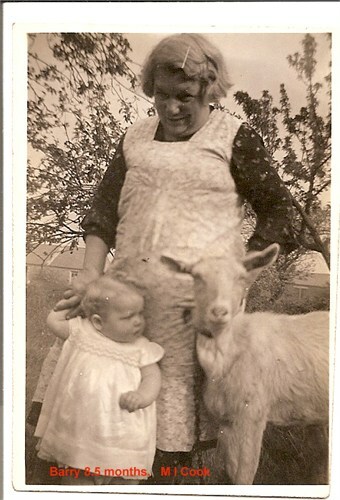 In 1918, William and Margaret had another child. They named him Ernest/Earnest. In the 1921 census, William is listed as a Police Constable living at Stellarton Rd, New Glasgow. Living with he and Margaret are William’s 3 step-children, David and Ernest (#2) and a boarder James Marshall. It is a single family 6/7 room home made of wood which he owns. He reports his age as 64 (born 1857?). His income is $10,000. In David’s delayed birth registration dated 10 July 1929, William is reportedly living at 286 Eastern Parkway, Brooklyn, New York. He is not found at this address in the 1930 census, nor is he located in city directories. UPDATE Sept 2016 – William did register for a social security number in May 1937, and was assigned number 116-03-4563. Numbers beginning with 116-03, were issued in New York from 1936-1950. He provides an address, occupation, his birth date/place and parent’s names. He died 24 Jul 1937 in the Bronx, New York, and is buried at St. Peter’s Cemetery, Haverstraw, New York. His occupation was listed as “supt. apt house”. Robert William Little‘s whereabouts are unknown after arrival in 1906. Florence Little married Francis James Marmo (Supervisor of Ferry’s), son of James and Mary on 16 Nov 1909. 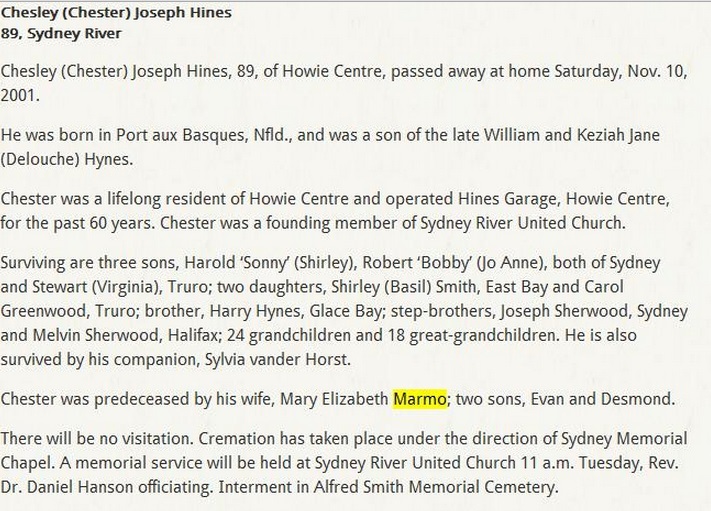 In 1921 they resided at 2 Anderson Ave., Sydney – Cemetery Transcripts read: Mrs. Francis Marmo 1888 – 1971, St. Joseph’s, Bras d’Or, George’s River, St. Elizabeth Hospital. They had at least two children, Mary Elizabeth born 1911 who married Chesley “Chester” Joseph Hines 25 Jan 1930 and Frances who married (1) Jim Beaton, (2) John Bonar. Chester & Frances’ obituaries name many descendants. Phyllis Marie Waddell 59, George’s River – It is with deep sorrow we announce the peaceful passing of Phyllis Marie Waddell, age 59, beloved daughter, mother, grandmother and sister on Friday, Jan.16, 2009, at her home in George’s River, surrounded by her loving family. Born in George’s River, Phyllis was the daughter of Frances (Marmo) (Beaton) Bonar of Sydney Mines and the late Peter James Beaton of George’s River. 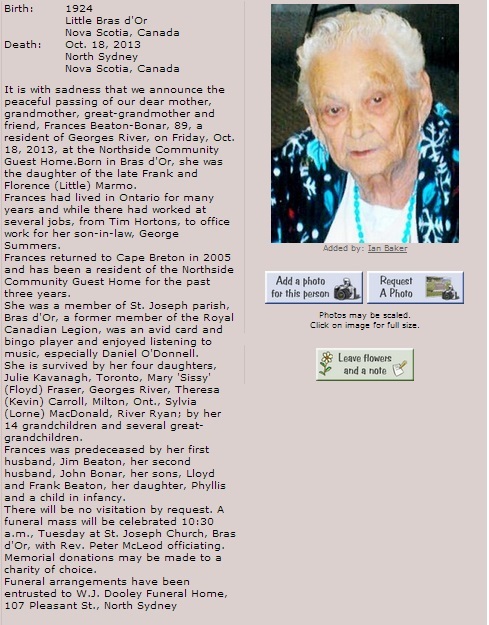 She was an active member of St. Joseph Church in Bras d’Or, and also a member of the choir at St. Anne Church, Alder Point. She was an accomplished painter and artisan and was also active with the legion in Frankfort, Ont., when she lived there. Besides her mother, Phyllis is survived by her daughter Terri McMillan (Terry Ross), Madoc Ont. ; granddaughters, Veronica and Paige McMillan-Ross; four sisters, Julia Kavanagh, Toronto, Mary (Floyd) Fraser, George’s River, Theresa (Kevin) Carroll, Sydney Mines, Sylvia (George) Summers, George’s River; sisters-in-law, Maureen Brown, Campbellford Ont., Lynne Early, Port Elgin Ont. She was predeceased by her husband, Ron Waddell, two brothers, Francis and Lloyd Beaton, brothers-in-law, Clarence Kavanagh, Tom Early and father and mother-in-law, Maurice “Bob” and Monica Waddell. There will be no visitation by request. Funeral mass for Phyllis will be held at 10:30 a.m., Monday, Jan. 19, 2009, at St. Anne Church, Alder Point, with Rev. Peter MacLeod officiating. Funeral arrangements under the direction of W.J. Dooley Funeral Home, 107 Pleasant St., North Sydney. Online condolences may be sent to info@wjdooley.com. Selina “Lena” Little on 14 Nov 1909 married George William Long, son of George and Elizabeth (Jobes) Long. They had at least three children: Elizabeth Ann (1911), Margaret (1913), George William (1914). She died before 1921. Her husband remarried a woman name Jane with whom he had a son Emerson (1921). In 1921, her children were all living in Little Bras d’Or, Cape Breton. Elizabeth Ann married William Henry Tobin 3 March 1930 and in 1958 was living on Butts Street, Sydney Mines. Margaret married Edward Francis Dawe, 1 Feb 1932, in Little Bras d’Or. 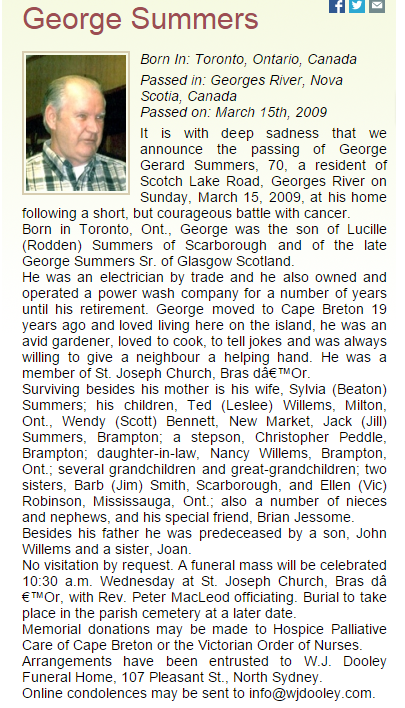 George married Pearl Reid, 25 April 1935, in Little Bras d’Or. Pearl Reid had 8 children; Anna, Robert, David and Fern(my mom). The other four children died of hypothermia as they lived in the shacks of the mining company. Because of this they moved to Catharines Ontario. I actually have George William Long Senior’s passport. He was born in Glace Bay on January, 2nd, 1892. Passport number 925311. He has grey eyes and red hair, looks grey in the pic. My sister just had a baby girl and named her Pearl. Pearl and George’s(my grandparents) children who passed away were named Pearl, Robert, Shirley and Miriah. Anna had four children; Heather, Robert, Wendy and David. Robert had Tammy who passed at age 7 from a brain tumor, Robert and Sherry. David had Lisa and Stacey, years later he had Cory. Fern had Chris, Mark(me) and Mandy. My father is a Halliday. His mother was a McNeil. Eleven children in that family. 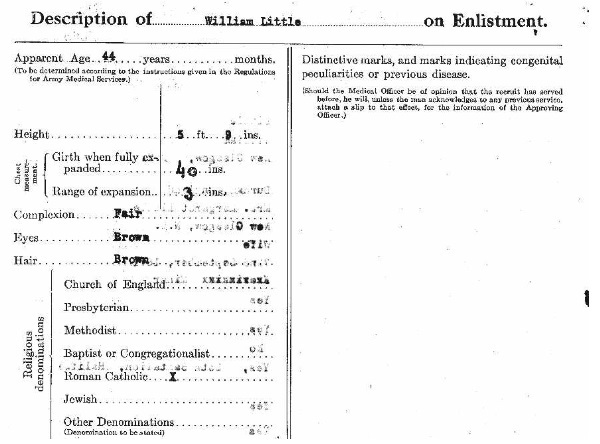 Ernest Little #1 was part of the 25th Battalion. 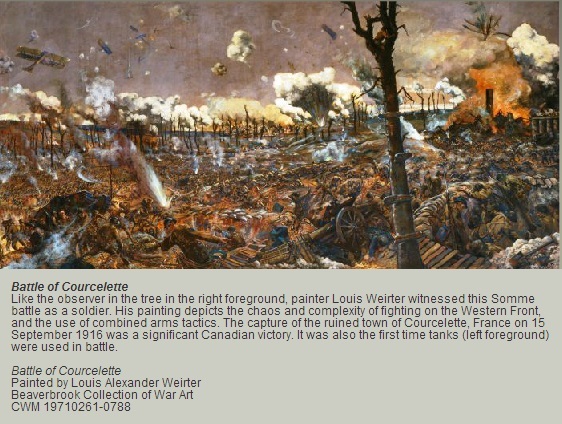 He gave his life 16 Sept 1916 in the Battle of the Somme, Courcelette, in World War I. He was 24 years old and described as “5’7″, fresh complexion, grey eyes, brown hair”. 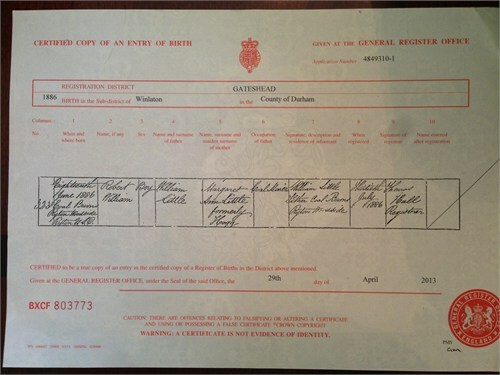 His father is listed as William Little and his mother as Mrs James Pickup of Newcastle-on-Tyne. Formal adoption did not exist in England and Wales until 1927. Before then, adoptions were usually informal. In a few cases there was some legal documentation, but no central register. No reference was found in the Cottage Homes Committee minutes for a request from William Little to adopt Ernest Pickup, so it may well be that he adopted him informally. Assuming the passenger list entry refers to Ernest Pickup, it would appear that he started life in Canada as Ernest Little but seemed to have ties back to his mother in England. Research order: search the records of St Nicholas Hospital, Gosforth (Newcastle City Asylum) for an entry for Elizabeth Pickup to try to verify that she was Ernest’s mother. Elizabeth “Betty/Lizzie” Little may have married James William Doward on 31 Oct 1911 in Glace Bay (the marriage record lists William and Margaret, an accurate birth year in England, however she is listed as Presbeterian when the family seemed to be Roman Catholic – given the commonality of names this might be another Elizabeth Little – I have not yet viewed her death record, which may help to determine if she was our Elizabeth). This particular Elizabeth relocated to Lynn, Massachusetts and had six children: Ethel Beatrice (1912), John Robert (1914), Elizabeth Ann (1915), George Howard (1918), Margaret (1920) and Lena Olive (1922). The family relocated to Lynn, Massachusetts about 1924. Young Elizabeth died in 1928. They were enumerated in Lynn in 1930. In 1940, George and Lena still reside at home with their parents on 302 Summer Street, Lynn. Lizzie died 8 Sept 1958 and is buried in Pine Grove Cemetery Plot: Plot-K,Lot-91,Grave-1. Ethel married an O’Brien, she died in 1994. John Robert married Louise Ann Savary, they had at least 4 children, he died 8 Nov 1961. George Howard married Rita LeMay, he died 6 Oct 1965. Margaret died 1 March 2001. Lena Olive died about 1994. David Little married Dorothy Elizabeth White/LeBlanc (my husband’s grandparents) daughter of Herbert Joseph LeBlanc/White and Anna Marie Brown, in Lynn Massachusetts. They had 6 children – Donald, Robert “Bob”, David, Dorothy, Herbert John and Anna “Chick”. Ernest Little (#2) is possibly at a tuberculousis camp in Rockaway Beach Hospital, Queens, New York in 1930. He died in New York City, Richmond, New York on 10 Jun 1935 at age 18. Step-daughter from his first marriage Mary Isabella Eltringham stayed in England and married John Codling Cook. They had three children – Margaret Ann, Barbara Mary. and John Siddle Coding. Step-daughter Madeline Vincent crosses the border to Vermont in June 1923. She gives her final destination as 34 North Street, Middletown, NY and a contact name of Margaret Vincent. She is 5’4″, of medium complexion with dark hair and gray eyes. Her whereabouts are unknown after this date. Step-son Frank Vincent’s whereabouts are unknown after 1921. 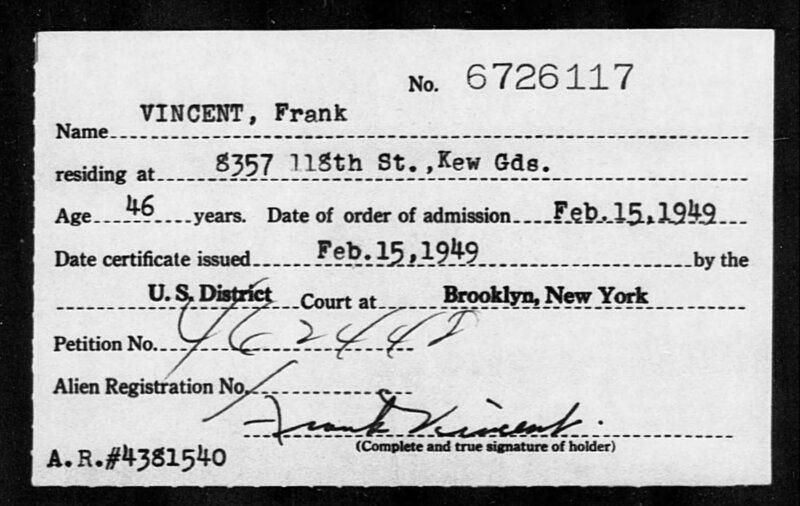 There is a Brooklyn, New York naturalization for a man of the same name which may be our Frank. Further research is needed. Step Daughter Margaret Jean Vincent arrived in Vanceboro, Maine, 21 May 1920 and again in March 1921. She gives a contact as her aunt, Mrs. Henry Burgles/Burghes (? ), 59/591 Main Street, Waltham, Massachusetts. She returned to Canada in time to be enumerated in the 1921 census. She became a US citizen on 27 Nov 1926. She married Harold Bedford (a US Navy WWII Plot). They resided in Honeoye, New York and had no known children. Margaret was a American Legion Auxiliary Member who volunteered at the hospital. She enjoyed Bridge. She died at age 97 on 29 May 2001 in Lake Panasoffkee, Florida. Frederick and Robert who traveled with the family to Canada whereabouts are unknown after arrival in 1906. 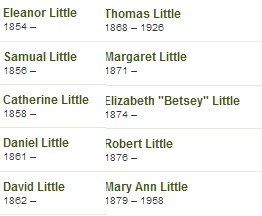 (1) William Little gives birth dates between 1857 and 1872 – why? Are all the records the correct William? (2) What happened to William’s first wife Margaret? (3) Who was Robert #2 that came to Canada with the family? What happened to him, Frederick and Robert #1 after arrival? (4) Who is Margaret Vincent’s aunt, Mrs. Henry Burgles/Burghs, 59/591 Main St., Waltham, Massachusetts? Is she also aunt Jane Burwell, Boston, Massachusetts? (5) How did Thomas Eltringham die? How did Gabriel Vincent die? (6) How do I find Nova Scotia land deeds on the home William owned on Stellarton Rd, New Glasgow in 1921? (7) Who are the various boarders listed with the family in the censuses and the witnesses at their wedding? (8) Are there any living descendants of William who may have records/photos? (9) What happened to Margaret after 10 July 1929? Where is she buried? Today, I thought I would share a few hard learned lessons. The parents of my husband’s maternal grandmother Dorothy Elizabeth White, who married David Charles Little, in Lynn, Massachusetts, have been a mystery. I easily found Dorothy with her parents Herbert Joseph White and Annie M. in the 1920 and 1930 censuses. Herbert’s “Petition for Naturalization” is online. I collected a draft registration and an SS-5 (social security application) for Herbert and a death certificate for Dorothy from the Lynn City Clerk. (1) Herbert was born on lot 5, Prince Edward Island on 29 August 1889 and arrived in Maine via rail in December 1908. (2) His wife Annie M. was born in Boston , July 1894 to a German father and Irish mother; her daughter Dorothy’s death record lists Annie’s maiden name as Elezer. (3) Dorothy was born on 12 June 1912 in Lynn, Massachusetts and married David Charles Little about 1928. This is where the trail ends. No record on Ancestry.com, Family Search or American Ancestors, nothing in the Massachusetts index books at the Massachusetts vital records office or at the Lynn City Clerk’s office for the marriage of Herbert & Annie, no birth for Dorothy, no marriage for Dorothy and Charles, no death record for Annie or Herbert. Neither Annie or Herbert are found in the 1910 census in Massachusetts and there are no families with a surname close to Elezer in all of Massachusetts with a combination of Irish/German descent. I instantly feel like a dope! My Lithuanian’s changed their name when they arrived, a common occurrence with many immigrant groups; I have been taking Spanish lessons twice a week for the past five years and know full well that blanco (blanc in French) means white; and my maternal grandmother was Acadian (a family I have traced back to the 1600’s thanks to an mtDNA test) and my tree is full of LeBlancs. [Side note: After a bit more research using the microfilm for St Anthony’s Bloomfield at NEHGS, and other sources, I now know that my husband and I are 10th cousins through at least six different sets of grandparents]. My research propels forward! The Lynn City Clerk has Dorothy LeBlanc’s birth dated 12 June 1912 and Dorothy LeBlanc’s marriage to David Little. 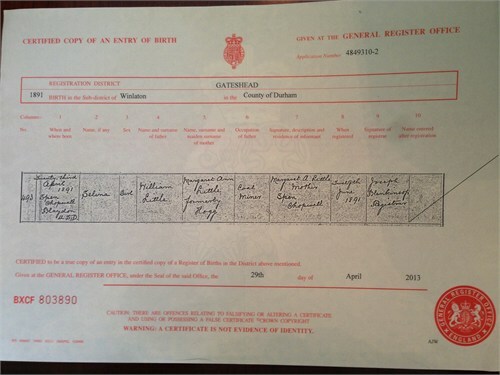 Her mother Annie’s surname on both documents is listed as Brown. I search the Lynn newspapers at the Boston Public library and find obituaries for Annie, Herbert & Dorothy but none provide clues to Annie’s origins (although it does confirm a Boston birth). Then, success! Can’t fool me twice!! Brown “germanized” is Braun. I find an Annie Brown/Braun in the 1910 census living in Boston with her German father George Brown/Braun and Irish mother Mary Keohane/Cohan. The ONLY German/Irish Brown/Braun family in all of Boston with a child Annie. Annie is no longer with the family in 1920 (perfect, she shouldn’t be – she is married and living in Lynn with Herbert!). Annie is listed as Agnes in the 1900 census (obviously a census taker error) and her birth date listed as Feb 1893 instead of July 1894 as on Herbert’s naturalization (another census taker error or Herbert not knowing his wife’s birth date; typical man). And the surname Elezer from Dorothy’s death certificate… Well, Dorothy was dead. She couldn’t give her mother’s maiden name. Herbert was still alive when his daughter died, typical male, perhaps senile – he just messed up his deceased wife’s maiden name. Anyway, I digress. The Brown/Braun tree is fascinating. Annie descends from Friderich Braun who was born in 1821 in Germany. He travelled to America (alone) with his 9 children in 1873, settled in Boston and is buried in Holyhood Cemetery in Brookline, Massachusetts. His son George is employed by a furniture factory. My husband is thrilled to hear this! His love is his woodshop. He finally feels a connection to his otherwise dysfunctional, crazy, misfit, alcoholic family. For 4 days, I stayed up until 1 or 2 AM adding no less than 213 new family members and hundreds of records to the Brown/Braun tree. I corresponded with seven “cousins”, found the family’s ship manifest on Ancestry.com and ordered George’s naturalization from NARA (which is on the way to me as we speak). Annie M. had 6 siblings, all of whom have birth & marriage records online and all of whom I easily traced forward to 2013. Then, 4 days later, I realize I hadn’t discovered Annie’s birth record. Strange. I found records for all of her siblings in Boston, Massachusetts. After some creative searching, I found a birth dated February 23 1893 (the same month/year listed in the 1900 census) for a “Sophia Agnes” born to George Brown and Mary Keohane. The address matched that of a few siblings. The name Annie was written and then crossed off – the informant was not a family member (probably a midwife). Hmmm… I recalled that the 1900 census had her name as Agnes. Can you say “light dawns on marble head”…. Did I have the right Annie? or did I jump to conclusions…. Then I think…how did Annie M. Brown and Herbert J. LeBlanc meet if he lived and worked in Lynn and she resided in Boston. I try another search – 1910 census, Lynn, Massachusetts, Ann* Br*n – father German, mother Irish – I hold my breath, hoping for nothing to appear as I tentatively hit the search button – Up pops an Annie Brown living with her mother Annie E. Blazer and step-father John. I search for the Blazer’s in the 1920 & 1930 census. Crap. There they are in 1930, living on Summer Street in the same house as Herbert/Annie White and Dorothy/David Little. Blazer/Elezer?…pretty close, sounds like an error when the Lynn Clerk was reading/transcribing information onto the death certificate… There is even a French Canadian “Arsenault” boarder living with the German/Irish couple – Arsenault is Herbert White/LeBlanc’s mother’s maiden name. Why had I not noticed this? I learned long ago to ALWAYS look at the neighbors when I find a census record! I do a Google search on Annie E. Blazer. Up pops an article from the Lowell Sun dated 1937. “Will Orders Dog’s Death”. Annie Blazer leaves an interest in her Lynn home to her daughter “Mrs. 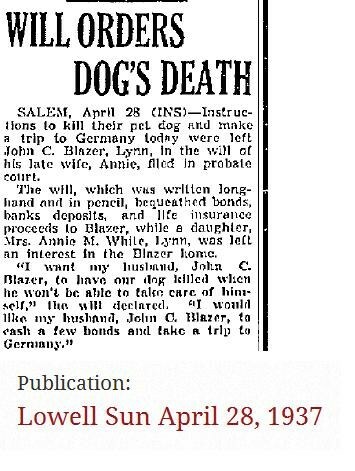 Annie M. White” of Lynn AND she wishes to have her dog killed, because her husband John E. Blazer can’t even take care of himself! Now that sounds more like my husband’s crazy family! I couldn’t bring myself to delete the 213 Braun/Brown’s – so much effort went into piecing together this unrelated family. I deleted George Brown and Mary Keohane in the “relationships” tab of Annie M. Brown’s Ancestry.com record and instead added Sophia Agnes as their daughter. Maybe my efforts will help some other researcher. I still have not found Annie’s father – I am secretly “hoping” that he is somehow part of this Boston Brown/Braun family. Annie M’s mother, Annie Elizabeth Callan/Callahan, daughter of James Callan/Callahan and Annie Kehon (maybe Keohane ? ), was listed as a widow when she married her second husband John Blazer in Maine on 7 December 1905. Another mystery – what was she doing in Maine? Was Annie M. really born in Boston? Where did her father Brown/Braun die? This time I will be a bit more careful before jumping to conclusions and adding records to my tree. Need I say more? Hard lesson learned!